Frame issues in the heavier models??? I remember some discussions of frame issues with the 2005?6?7? era campers in the heavier models, but never paid attention having a lighter t-1950. I seem to remember it being the tongue attachment to the main frame. Can someone give me some info or suggest a thread? I’m looking to put some more weight on the tongue and would like to know what to look for for issues. Man, that was one "enlightening" thread. It's nice having a local friend who welds. And SOC friends who knew the issue personally and suggested several fixes. So, folks fixes appear to have up over the years??? I'll share what I have learned since the T2499 thread years ago. The issue of the bent and broken frame header can and has happened on other floor plans other then the T2499 that use the 4" channel iron A frame. The 2005 to 2007's T2499's before Sunline figured out the final fix, had the issue show up early in their life. Other Sunline floor plans, took many more years for the problem to show up. Same issue, it just took longer to occur. I'm not seeing this as just a 2005 to 2007 issue, the science at the moment says it can happen on older Sunline too if the conditions are right. But, as I said, other floor plans then the T2499 have had the issue. I myself have seen 3 of those failures in the last 2 years and I repaired one of the 3 in my shop as I now own it. Keep this in perspective, this does not mean all Sunlines that have a 4" A frame will have this issue, it takes a set of conditions to allow it to happen and all the conditions have to align at the same time and repeat a number of times before failure occurs. This is what I have found. 1. The loaded tongue weight can be high. High is considered between 750 to 1,000# or higher. This has to align with no. 2 and 3 below to be a problem. 2. The owner is using a WD hitch. Odds are higher for a failure with larger WD bars, 1,000# and up bars but we have had one member reported with 750# bars have the issue. There are subsets to the WD factor. 2A. The WD being set too aggressive to drop the front end of the truck will aggravate the issue. 2B. WD is used to shift truck bed weight that is not part of the camper tongue weight can aggravate the condition. (WD bars loaded more than normal TW) Example, the owner added extra firewood on several camping trips aft of the rear axle after the original WD settings were made. 3. Miles traveled and areas traveled when item 1 and 2 are at their higher end. 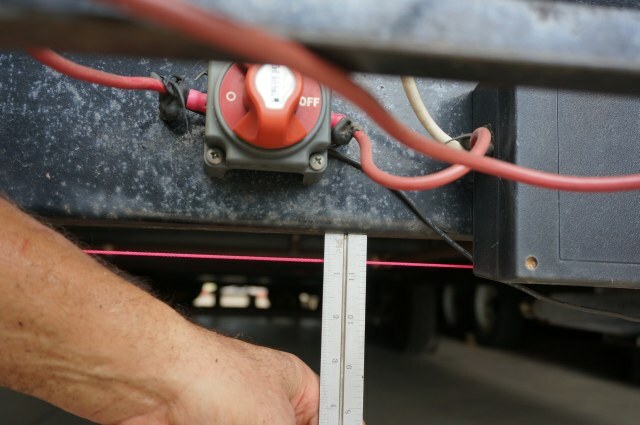 If the camper is towed on level flat ground, the risk is lowered. A lot of uneven ground aggravates the issue especially when turning. The 4" channel iron used is strong enough in the vertical direction for campers in the 5,000 to 7,000# GVW area. However, the channel iron shape has limitations in how much twist it can handle. If the twisting load is low, there is no issue. If the twist loads are high, that excess twisting has to be resisted by the frame header. The frame header design has not changed a lot over the years on many brands. And Sunline used the same header concept for many years without large scale issues. The Sunline header was cut at the bottom to allow the channel iron to pass through it during fabrication. The header was also shorter in height in some cases. That cut is not a problem by itself, but when excessive twist from the A frame rails comes with that design, the header can buckle in the center and/or bend the header down pivoting at the outside edge of where the A frame goes through the header. The 2004 T2499's had 5" channel iron A frame rails and it has a larger strength in resisting twisting for the imposed loads then the 4" channel using the same header design. My big T310SR having a GVW of just under 10,000# has a 6" channel iron A frame with the same cut bottom header. But, 6" channel being thicker and heavier has a much higher resistance to twisting then the 5" even and has no issues with the heavy 1,600# loaded TW I have. 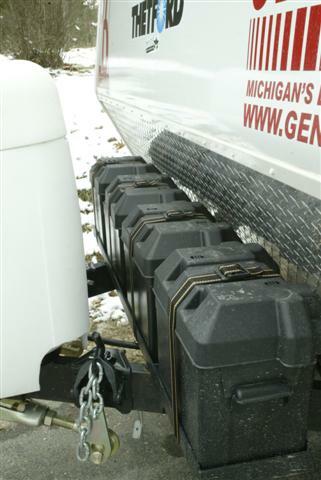 When using a conventional type of WD hitch (excludes the PullRite hitch) the WD bar chains or L brackets hang on the top side of the A frame. 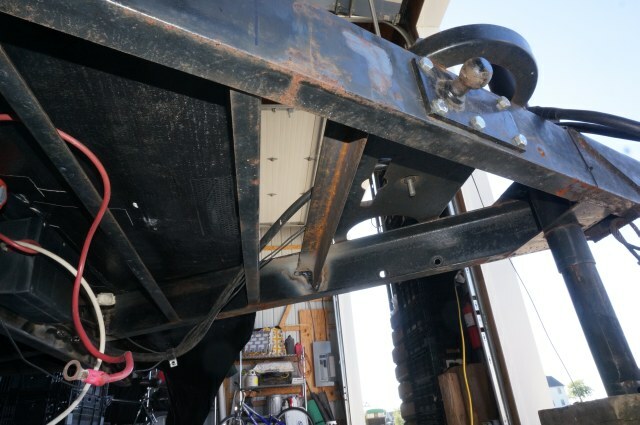 In a turn on uneven ground, one side of the A frame is loaded heavily by the TW of the camper and that sides WD bar while the opposite side of the A frame is unloaded at its WD bar. The entire A frame is trying to be twisted. The WD bar on the loaded side pulls on the chain bracket or L bracket at the top and tries to twist the A frame rail outward at the top. 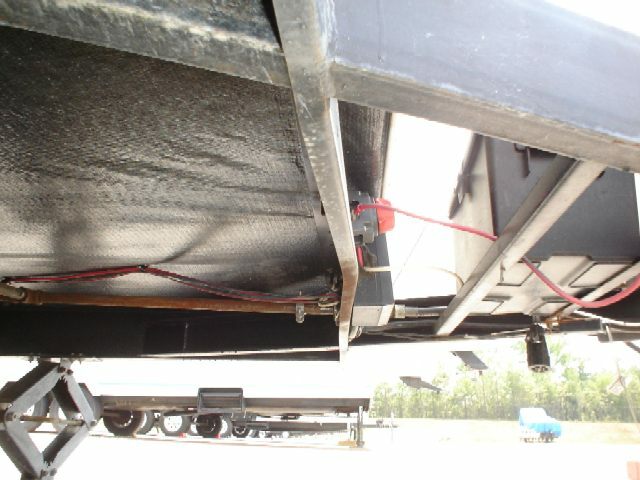 If the A frame twists enough, the header has to resist this high twisting load that is putting large forces presing inwards towards the center of the camper. If it cannot handle the twist, the header starts to buckle in the center and or the part of the header past the A frame rails starts to bend down. Here is a picture from my prior 2004 T2499 with arrows showing the force directions I'm talking about. There was no issues with this camper and it had a 1,200# loaded TW. 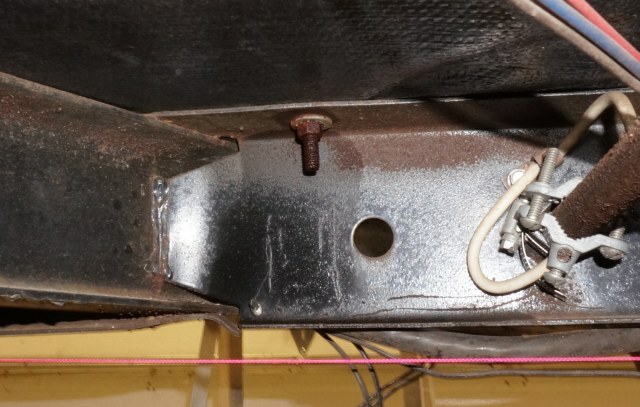 A buckle/starting to separate the header connection at the A frame rail. How I repaired the issue. Added angle iron reinforcement to the A frame at the snap up brackets to help stop the A frame twisting. After jacking the header back close to straight, added rectangular tubing reinforcement along the bottom of the header to tie the main frame rails, the A frame rails and the header all together to resist the twisting forces. Again, this all comes down to circumstance. My 2004 T1950 had 1,000# WD bars on it from the prior owner. It made it across the county at least 2 times. It also sat parked for 8 years too until I bought it. The A frame and main frame rails are 4" channel. The header is straight as an arrow. I will reinforce it before I start towing it as a precaution. A year ago, I inspected a 2005 T2363 for a friend up in MI. The header had failed/cracked at the A frame connection. It was close to seperation. Odds are high the owner never even knew about it. The dealer didn't either until I pointed it out. Unless you look for it, or that your battery drops some as that gets affected too, you do not always know the problem is occuring. I also have a 2005 T2363 I restoring now for a friend in NY and his header is straight as an arrow. He bought it new and has 1,000# WD bars. He camps a lot, just short trips. 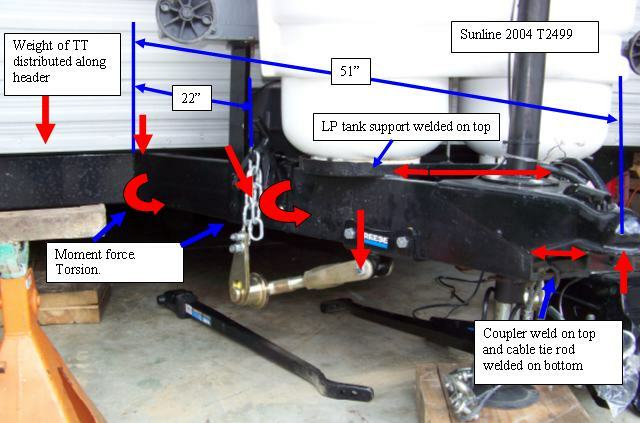 All this said, our forum member EMAN, had a 2007 T2499, it was one of the fixed 4" A frame/header setup's by Sunline. He also welded on a heavy angle iron battery bank for 4 AGM batteries and 2 bicycles on the A frame and toured the west off road in some cases for a few years with no issues. He was sort of our test case not knowing it at the time, where if you can stop the A frame twisting, the 4" channel can work under heavier than normal loads. What exactly were you planning on adding to the A frame? Double phew... So I read through the original thread last night, skimming a lot and slowing down at the good points. There a lot of good folks on there that I recognized as active from when I started here back in 2011, but are no longer around. Thanks John for your summary and pics (that summary should be posted as post #2 in the long thread). I have been watching the A frame tongue and header over the years because I vaguely knew there was a design issue there from reading the chatter about it. Now I feel like I fully understand it and the potential fixes. i have all the frame to have an issue with more tongue weight (12 gauge header, 4" channel A frame tongue). Header looks good within what my very good eye can discern. 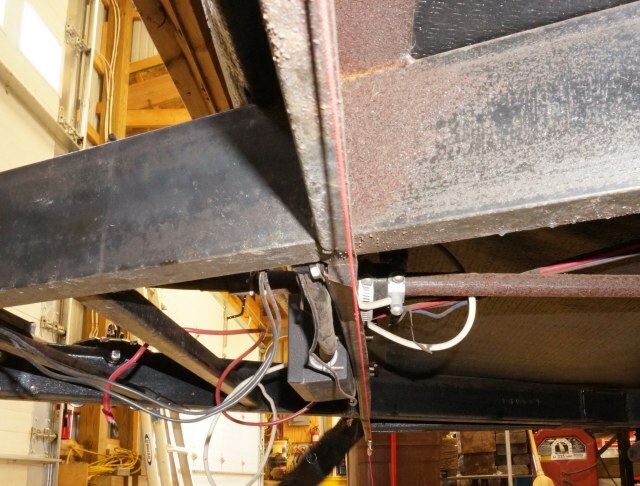 I have noticed over the years that the passenger side weld where the tongue channel emerges from the header weeps rust from where the bead sort of rolls over on itself. It looks sound, but there may be some movement, it also may rust because you can't get paint in there. I am thinking of adding a frame to support our generator above the tanks and batteries on the tongue. I think there is room to do it and there is a commercially available one (although I'd fab my own). Would add 100 pounds to our 500-550 current. 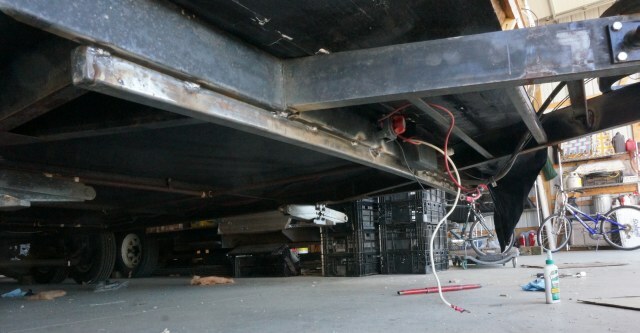 As I'm looking at it, the new generator frame would be fabricated from angle and be attached to the tongue (similar to the stromberg: https://www.amazon.com/Stromberg-Car...dp/B00U8AXRPW/). I'm not looking to do this this year, but for next year. This is in the goal of getting the generator out of the prime real estate of the very rear tier of the back of the truck by the tailgate. With the T-1950, keeping gear (boots, camp chairs, etc...) in the truck, but available is essential and having one less thing (generator) in the very best position for easy access would be great. I would also replace my battery tray supports with some hefty angle. I have already beefed up the rear battery support with a piece of 1" tube because the 2 6V deep cycles are too heavy for it (it allowed the batteries to bounce/rock as it flexed). A more permanent fix (mine is a quickie) would be good and 2 stout pieces of angle would help the issue you describe. I do not weld, so I need to have the work done. I also have at least one spring hanger that the bolt hole is wallowed a bit that I'll need to get done, so I need the welding done anyway. Weld to fix hanger holes, weld to make generator frame, weld to upgrade battery tray and maybe to add a behind the header support. Yes, understanding the problem is key in all this. 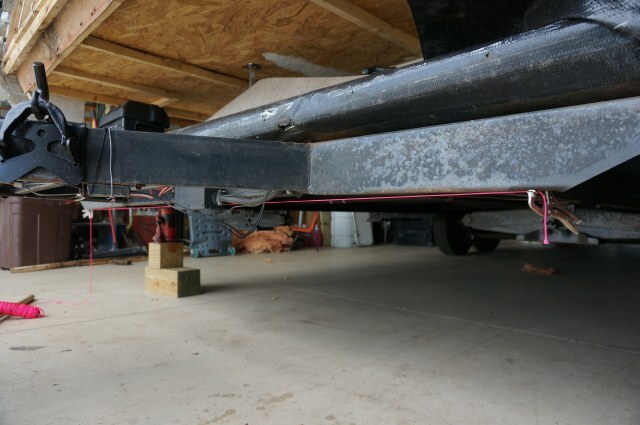 And for sure, reinforce the header while it is straight and the area where the WD bar chains or L brackets for your WD hitch go. The good news, you are starting at a 550# loaded TW. I found a picture or EMAM's 4, AGM battery rack. And he later added 2 bicycles over the top of it. Have not found those bike pics yet. My memory recalls hims using angle on welding on top of the A frame for the battery rack which aligns with the pic. And it was healthy angle. His T2499 had the last working Sunline fix in the header. I feel that battery rack he had made added to his success of traveling all over out west with it without failing. See here from his forum Photo album. As FYI I did find this one from Frank. He had 4, 6 volt batteries on his T2363. Again a 4" channel iron A frame. The battery rack added reinforcing to the A frame. He may not have towed it that far to give it a good test out like EMAM's was. Good luck in your planning stages and looking forward to seeing your handy work. So great to have such robust grist for our proverbial mills. OK, one last question.... and this relates to what I'm seeing above and the fact that EMAM didn't have a problem. In reading through the old thread many, if not most, of the pics are missing, so I can't develop as good of a pattern in my head as those who saw all the pics did. BUT the question I have relates perfectly to the T2363 photo you posted above and EMAM. How did the header bend on the T2363 above and not bend the battery tray angles? I'm wondering if the twisting forces are more weird than simple twisting of the channel. The tongue channel is unsupported in the long span at the top so perhaps in cases where the battery tray angle holds up the tray area serves to lock the A frame in and therefore all movement would have to pass that area at the top of the channel. An angle reinforcement at the top and battery tray supports that held at the bottom would stiffen the tongue. Does this make sense? given that there is apparent movement of the tongue of the T2363 above to bend the header, but the battery tray didn't get damaged, the movement had to pass along the top of the channel. EMAM was able to punish his without failure and his tongue was top and bottom stiffened.